Two delightful days of teaching Beginner Free Motion Machine Quilting with the Courthouse Quilters. Oh man is this an amazing group of Quilters! This group is close enough that I brought all my stuff including my machine and a good deal of my thread and some of the Houston swag including the Karen Kay Buckley Scissors which were used to cut batting. Over the course of the 2 days there were 30 students. Everyone got to feathers and a few students went well beyond feathers. Oh I had so much fun. Check out this smilebox that Carol Esch made. I love the photos she took though I am surprised she didn’t get one of my feet because the shoes came off and I walked around in my teaching socks, highlighter yellow one day and hot pink and black the next. I took the opportunity with the Bernina 440 owners to work with them using their BSR’s (Bernina Stitch Regulator’s). By making simple adjustments these quilters were happily stitching along. And then there was this quilter. And a very focused student at that. Mark worked all day. I expect that Mark will be quilting his own quilts soon. At one point he went out to his car for his ear buds cranked up the tunes and just quilted. Kathie stitched this tea cup. She’s been quilting a bit. There’s a neat photo of the two of us in Carol’s smilebox. Kathie is 5′ 8″ and I’m 5′ yep there’s a height difference for you. And of course there was a little shopping – Carol and I went to Two Buttons next door to a delightful restaurant called lovin oven in Frenchtown. Two Buttons is Elizabeth Gilbert’s shop. And I’d left my camera in the car 😦 but its a feast for the quilters eye. 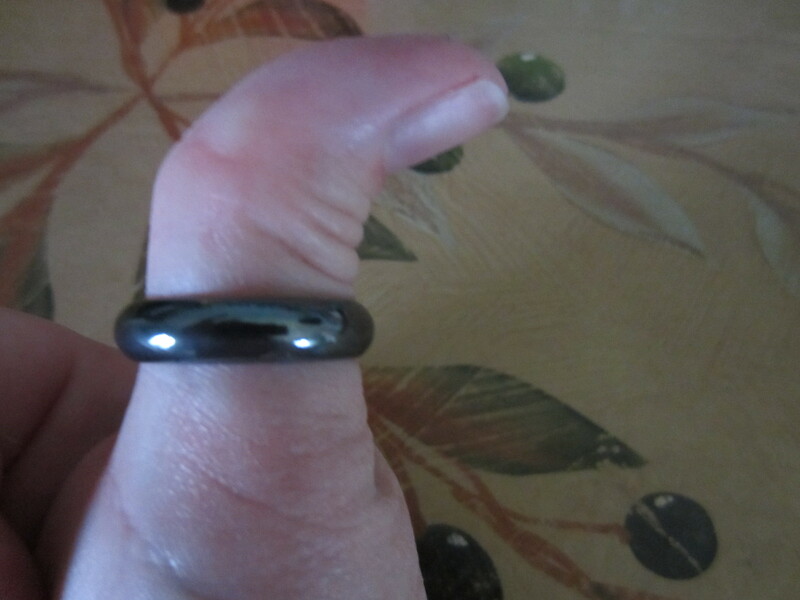 I picked up this ring for my thumb. And no my thumb doesn’t hurt it just does this. Until my early teens I thought all thumbs did this. One of my nieces get’s upset cause she thinks her thumb should bend like this and it doesn’t. Poor kid! Thanks Teri, my quilt group up here in the northern woods of Maine now want ME to do a demo of free motion quilting. I’m not ready!